Rotary Club of Brazos Valley Blood Drive | The Rotary Club of Bryan Texas, Inc.
Rotarians, please register to capture your activity points and to receive a reminder! Call Charley Gilliland to find a specific reservation time slot. Everyone who attempts to donate in August will receive a free voucher good for one pint of Blue Bell ice cream. 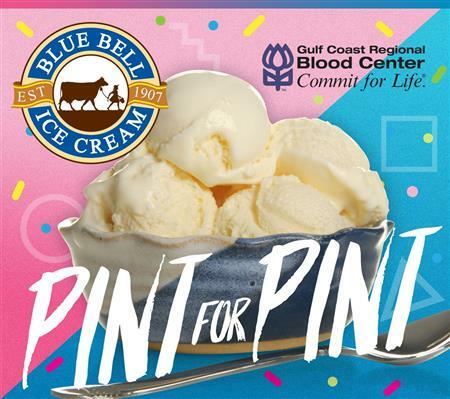 The Blood Center has been proud to partner with Blue bell creameries for more than 25 years! Rotarians and Friends of Rotary, since 1 in 20 people donate, only 5% of the population is saving lives. Here's your chance to be part of the 5%. BE A HERO! CHANGE SOMEONE'S LIFE. Click on the underlined link to schedule a specific appointment time.